Every campus has a history and story to tell—and there is no single approach to campus preservation planning. The following outlines our philosophy and approach to planning. Marvin Grove at the University of Kansas. 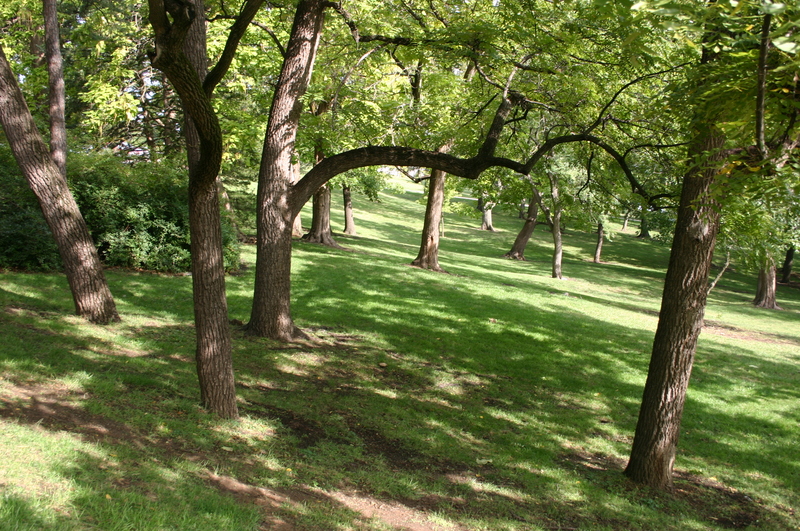 The sloping grove shown above was planted in the 19th century as the University of Kansas began to grow. Today it forms a shaded oasis on the sweeping prairie and is a highly valued campus landscape. Our Campus Heritage Plan for KU was funded by the Getty Foundation and recommended long-range campus forest management programs to preserve character-defining features while incorporating sustainability and resilience. In an age of homogenization of the landscape through urban sprawl and franchise development, American college and university campuses are increasingly rare as walkable environments where diverse ideas and people are encountered as a part of daily life. Colleges and universities are also becoming increasingly competitive in their recruitment of students, staff and funding. At the undergraduate level, students now have the choice of affordable vocational programs and general education at the community college level, for-profit universities offering the lure of secure employment, and hundreds of public and private colleges and universities in their regions. Campus designers sometimes cite the 1960s Carnegie Foundation report that prospective students make their decision to attend a school within the first few moments of visiting. But is this sudden judgment still the case in our much more complex time? Are architectural and landscape elements the only cues that really matter? Or is campus identity something far more subtle? Campus identity means more than just architecture and landscape master planning. It is the coursework and the social life that alumni long-remember. It is the questioning outlook of students that rewards faculty. Campus identity can be revealed in many ways: by involving students faculty and staff in photography and discussion surveys, through interviews with generations of alumni and prospective students, or through the outside insights reached by artists. Whether immense public universities such as the University of Wisconsin-Madison or distinctive liberal arts colleges as Carleton College or the University of Minnesota-Morris, each campus has a unique history, culture and mission for the future that can be documented and expressed in campus preservation and future design. The planning strategy here is one of revealing character rather than imposing outside standards and tastes. Participatory surveys, historical research, and campus conversation groups are all effective tools that that can define this “sense of place”–the people, places and events that distinguish a college or university—as a grounding for campus plans. Although campus heritage and identity research is a new niche on campus planning teams, its time has come. In the last twenty years, cultural landscape stewardship is now a major focus in American historic preservation. Many campuses that have preserved older pre-war buildings are now discovering the functional and aesthetic importance of the greens, quadrangles, malls, and streets that they frame. These outdoor rooms shape the first impression of campus for visitors; and they are the settings for the rallies, speeches, parties, and protests that are the legacy of every college and university in a democratic society. Answers to these questions can support clear, cost-effective guidelines for future renovation and construction of roads, paths, service, lighting and buildings. Campus heritage preservation and sustainable design share many goals. There is a commonsense economic value of preserving and reusing architecture rather than building anew. “Historic” campus buildings on campus need not be over a century old. Many public campuses benefited from significant WPA building and landscape projects during the New Deal era. The post-war boom of campus construction to meet returning GI’s and the mandates of the “Sputnik-Era” technology race, produced many find modernist science and classroom buildings that can find new use. There is no better way to create a mission-based plan for the future than to understand how an institution’s sense of its mission and purpose evolved over time. Historically-grounded planning addresses each institution’s historic academic traditions, support base, and constituencies to create a highly-refined facilities, academic, and financial roadmaps for the future. Campus heritage research can improve planners’ abilities to listen to contemporary constituencies and to find a shared language for developing planning concepts. Once the planning process is underway, historic research, public participation surveys and forums, and identity-related publications are all tools that can lead to a more widely-supported, pragmatic, and sensitive campus plan.